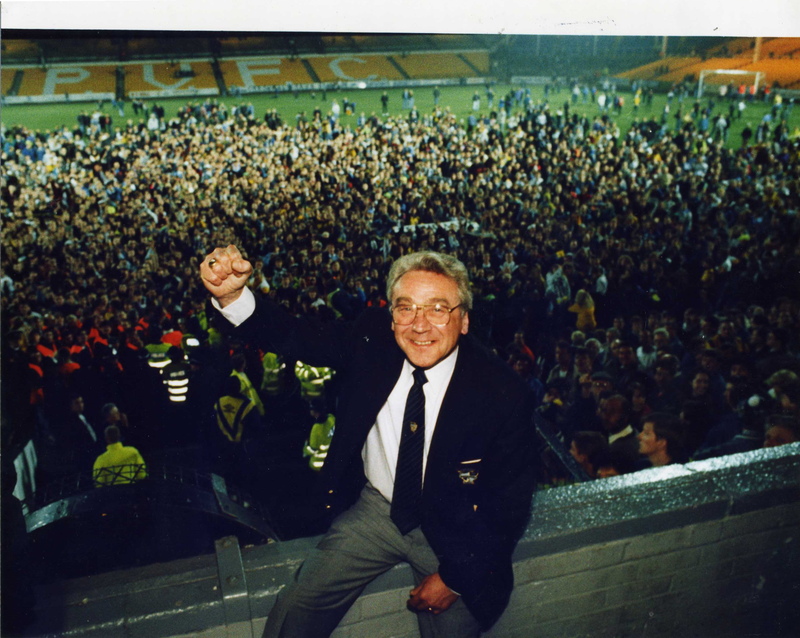 Port Vale Chairman Bill Bell celebrates with fans at the end of the 1993 season. He was the archetypal cigar-chomping, Rolls-Royce driving football club chairman. A man with a polished mahogany veneer but who was all solid, working class oak beneath. Yes he may have divided opinion – indeed he still does. I asked Vale fans on social media sites to sum up this most colourful of Potteries characters in one respectful word. ‘Shrewd’, ‘steadfast’, ‘cornerstone’, ‘foundation’, ‘wise’, ‘boss’, ‘astute’, ‘unique’, ‘character’, ‘unpredictable’, ‘entertaining’ and ‘rogue’ were some of the adjectives used. Other words that cropped up included ‘promotions’ and, of course, ‘Spurs’. Towards the end of his tenure at Vale Park, Bill Bell’s star was certainly waning – due in large part to the fracturing of his strained relationship with John Rudge. During the Valiant 2001 era he was reviled by many as the man who sacked the club’s most successful manager and took Vale into administration. Where had all the money gone from the sale of great players like Beckford, Guppy and Ainsworth? That’s what people wanted to know. The former Chairman’s unconvential business methods certainly came under scrutiny like never before and it seemed that his reputation would forever be tarnished. Had a group of Vale fans met in a pub 10 years ago I dare say their opinion of Bill Bell would have been negative as nerves were still raw. But time, and perhaps the events of recent years, have served to put the man’s period at the helm in a different light. I always got on well with Bill Bell. He was warm and generous and always had time for a chat or an interview. Interestingly, some of the people who knew him best at the Vale – those who were there before he arrived – still hold him in the highest regard. Groundsman Steve Speed is unequivocal. He said: “Without Bill Bell I don’t think Port Vale would still be at Vale Park. We would have had to move to a smaller ground somewhere else. “When he took over the place was literally falling apart and he laid the foundations for the stadium we have today. As Chairman he was so positive. He somehow managed to bring everyone together. “It didn’t matter to him whether you were a cleaner, a player or the manager – we were all on the same team. 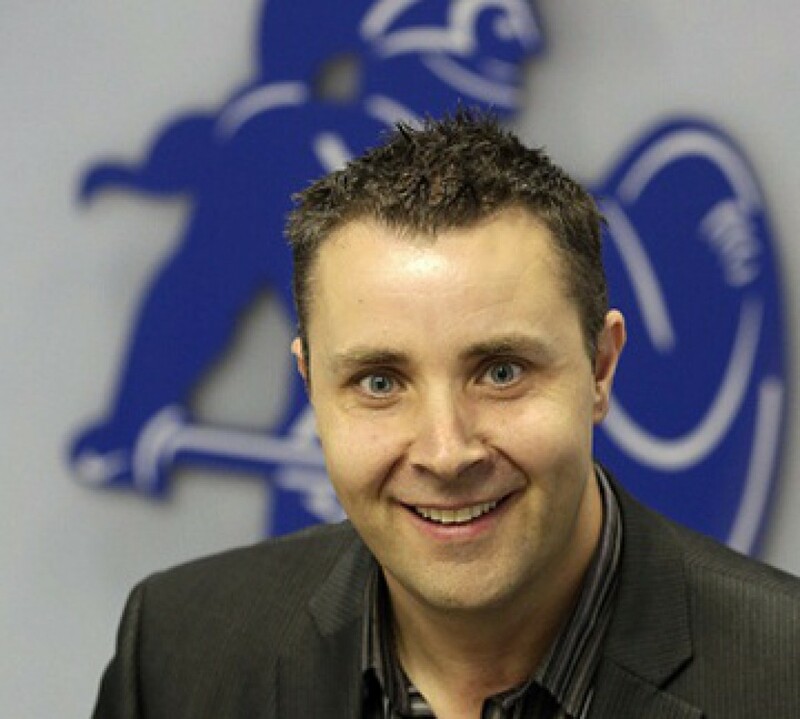 “Without his enthusiasm and his initial investments we wouldn’t have enjoyed the success we did – simple. “I think towards the end he perhaps felt that he hadn’t received the credit he deserved for what he had done in partnership with John Rudge. Club Secretary Bill Lodey was Stadium Manager when Bill Bell took the reins at Vale Park and views the former Chairman as ‘Vale through and through’. When I asked if Bill Bell had always been a Vale fan, Mr Lodey said: “Well he told me that when Vale Park was built he came along with his uncle and helped out with the work. “He certainly put his heart and soul into the club while he was here. “I think what’s crucial is that without the former Chairman’s initial investment to bring in the likes of Dean Glover and Neil Aspin – in the days before John Rudge was buying, polishing and selling-on players – we wouldn’t have gone on to enjoy the success we did. “What’s more I’m pretty sure those investments, which were big money at the time, came out of his own pocket. “He laid the foundations for the successful period when Vale fans enjoyed being in what is now the Championship and had numerous trips to Wembley and Cardiff. “He was a classic wheeler-dealer. I think he paid about £4,000 for the second hand Sealand Road stand from Chester City and had it transported to Vale Park. “What a piece of business that was. Just look at the stadium today to see what a difference he made. “Bill Bell was also incredibly down to earth and carried the respect of everyone here at the club. “Over the last decade or more I’ve heard more than a few people say: ‘This would never have happened under Bill (Bell)’. They’re right. Potteries entertainer Pete Conway, father of pop superstar Robbie Williams knew Bill Bell for more than 50 years. He said: “I think what is sad is that the Potteries has lost another of its most colourful characters. Pick up a copy of today’s Sentinel (February 16, 2013) for more tributes to Bill Bell in the Green ‘Un. 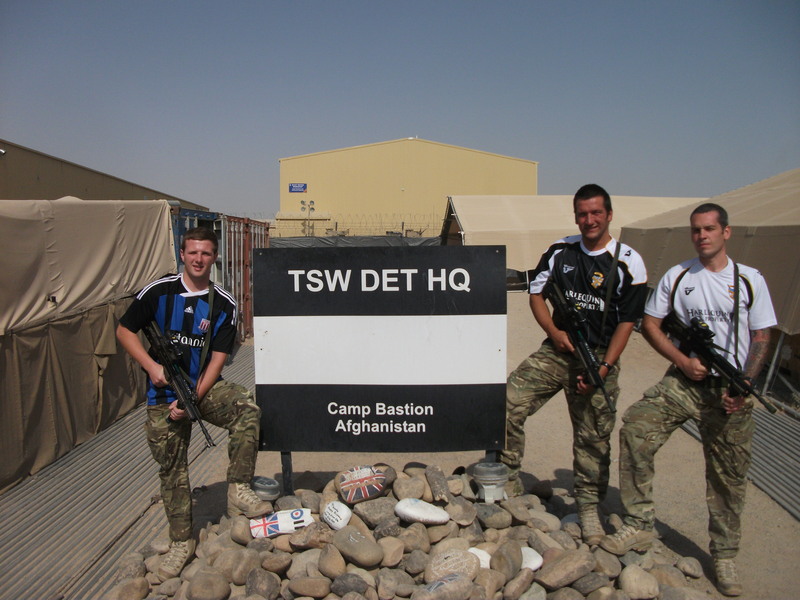 Port Vale is rolling out the red carpet for two servicemen who recently returned from war-torn Afghanistan. Corporal Steve Buffey and his pal Senior Aircraftman (SAC) Pete Blakeman will have the honour of leading out the teams before tomorrow night’s home game against Dagenham and Redbridge. Together with their families, the two die-hard Vale supporters will then be treated to a VIP match experience. The friends are part of the close-knit team in the RAF Tactical Supply Wing which is based at Stafford. While in Afghanistan, the unit was stationed at Camp Bastion, and was responsible for refuelling battlefield helicopters and Harrier jump jets. They kept their morale up with regular updates from home on the fortunes of their team and through banter with another member of the team – 22-year-old SAC Alex Haycock, from Sandyford, who is an ardent Stoke City fan. Father-of-two Cpl Buffey, aged 36, grew up in Kidsgrove but now lives in Stafford. He is a former Clough Hall High School pupil who joined the RAF 13 years ago after working in the pottery industry. SAC Blakeman, aged 29, who lives in Cheadle, signed up four years and is due to marry his fiancée Natalie Holdcroft in May of next year. The idea to treat the RAF personnel to a special night at Vale Park came from users of internet fans’ forum Onevalefan (OVF). Founder and Editor Rob Fielding explained: “Steve and Pete are users of OVF who had been corresponding with me during their recent tour of Afghanistan. “The OVF community felt it would be really nice to honour them on their return to the UK and the club have been brilliant about it and really made an effort. “Fingers crossed the lads can get three points for Steve and Pete. Club Secretary Bill Lodey said: “We were only too happy to help in these circumstances and pay our own special tribute to lads who are risking their lives out in the Middle East. “We want to give them a night to remember and have other surprises planned too. “Rob Fielding has volunteered to collect for Help For Heroes from fans in the away end and family members and friends of Cpl Buffey and SAC Blakeman will have collection tins around the other stands.